I have a two year old blue Quaker that we think might be a male. Usually very active and vocal, he is suddenly quiet and does not show excitement to see us. He sits at the bottom of his cage and does not move around his left leg seems a little weak. His poop seems good, his eyes are not cloudy or runny, breathing seems good. I see no other symptoms of a sickness as described on any web sites. Started yesterday, he was fine when getting up, but slowly got quiet. Currently I have him in a warm humid bathroom with some food ( seed, scrambled egg and life cereal) and water with honey in it. But he does not seem to want any. I can not afford vet costs so any help or thoughts would be very welcome, if only to comfort us and comfort Gabby. My name is***** and I will do my best to help you with Gabby. I'm sorry he isn't doing well and has you worried. To join the conversation, simply type in what you want to say and click REPLY. You are correct to be worried about him. Birds are masters at hiding signs of illness so any symptoms at all need to be taken seriously. 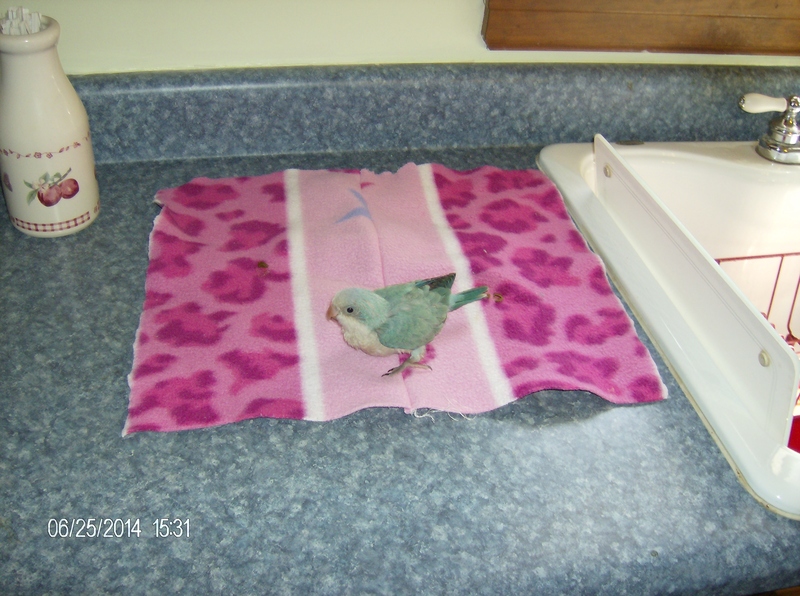 I want to do the best I can for him, but cannot afford a large vet bill and closet Avian vet is 120 miles away. 2. Provide extra calories. Offer favorite foods and treats. Make sure the food is easily accessible to him, especially if he doesn't have a lot of energy for moving around. Peanut butter, oatmeal, buttered toast. I like to mix rice baby cereal with corn syrup for critically ill birds. I'm sorry to hear his appetite is poor. That is alarming. Offer warmed foods, soft foods --- anything that makes it more likely he'll eat. 3. Provide calm, quiet, isolation. You want to be sure he's separated from other birds so he doesn't have to compete with them and also to minimize the risk of contagious illness spreading. In short, those three steps are the basics of avian first aid at home. I have two conures that are in a different room now. I know you already know this, but the very best thing would be for him to see a veterinarian if at all possible. You would not be overreacting to take him the 120 miles to the vet for this. I would love to do that, but do not have 300 dollars or more for testing and a checkup. And regardless, you'll be able to know you're doing your best for him. That's also reasonable. At least now you have some things to try at home. Corn syrup and baby rice cereal are readily available and inexpensive. Happy to be here. Please drop me a line to let me know how Gabby does. I'm just following up on our conversation about Gabby. How is everything going? Gabby went to the Emergency Hospital on Sunday and was put on antibiotics and tube feeding. Monday the Vet picked hi up and took him to his office. It is possible he may have an inner ear infection or had a stroke. He is still on antibiotics. Sunday he could not stand, eat or drink and was star gazing. As of 5:00 tonight, he can stand and does drink when water is placed in front of him. But remains star gazing. Vet will keep him for two days and if he does not improve then we will have to make a decision on what to do. Oh,my goodness! I'm glad you were able to get him to the emergency vet because it sounds like he is indeed very ill. I'm so sorry to hear this, but grateful he is getting the medical attention he needs. I'll keep my fingers crossed for a good recovery. He has been on medication now since Sunday. The only improvement seen was he is can stand and does drink water, But that is all. Still suffers from star gazing and looks like no hope for recovery. So will make decision tonight if there is still no improvement to put him to sleep. I'm so sorry to hear this. It's quite possible that this is being caused by a virus or something else that won't respond to antibiotics and supportive care. We are sad but did the right thing for Gabby and us. We have decided to devote our attention to a new baby bird. 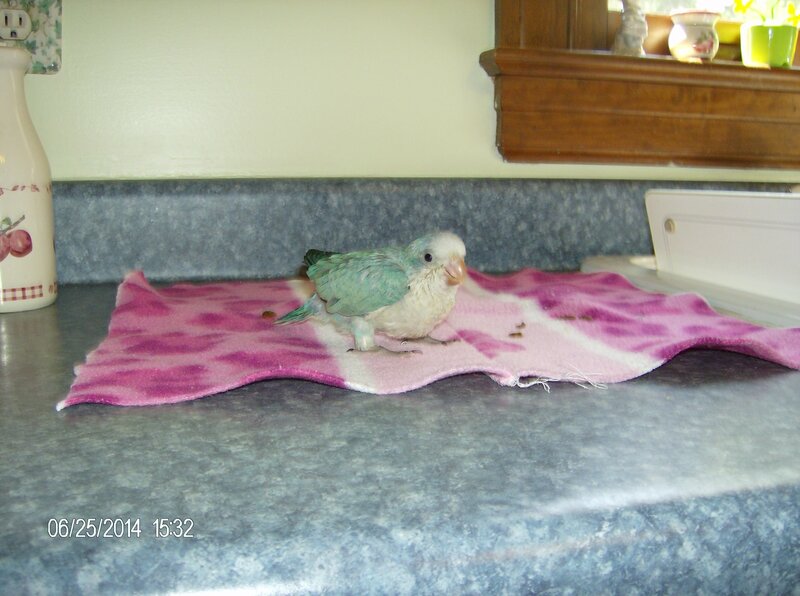 We are buying another Quaker baby tomorrow and will hand feed it to bond together. I am happy and sad at the same time. I'm so sorry for your loss, but happy for the relationship you will develop with the new baby. I hope your broken hearts heal quickly, and best of luck with the new baby. We have our new baby, not yet named, already my wife is in love so it has helped. I am sending you a picture of our new baby. Thanks for your help and concern, it was greatly appreciated. Oh ... how beautiful! I'm so happy for you! This is the good part about all of this. My cockatiel have been leaving very large mega droppings. My Quaker is sitting gripping his throat with his claws.